Withings today introduced its fashion-focused Withings Activité activity tracking watch, a device that combines modern-day fitness monitoring tech with a classic analog style. As you can see in the photo, the Swiss-made Withings Activité isn’t your ordinary fitness monitor – it doesn’t even look like one. But don’t let outside appearances fool you: The Bluetooth-backed Activité contains a suite of sensors to track movement, distance, calories burned and sleep quality. It’s even smart enough to adjust its time automatically when you travel between time zones. The Activité pairs with your iOS device and the free Withings Health Mate app to help you set goals and monitor progress. You don’t need to constantly get out your iPhone to check how close you are to your daily fitness goal, however – a secondary 0-to-100 analog dial on the watch face will provide you that data at a glance. The waterproof Activité comes in both black and silver colors, with an included Tanneries Haas leather strap and plastic band for sports use. 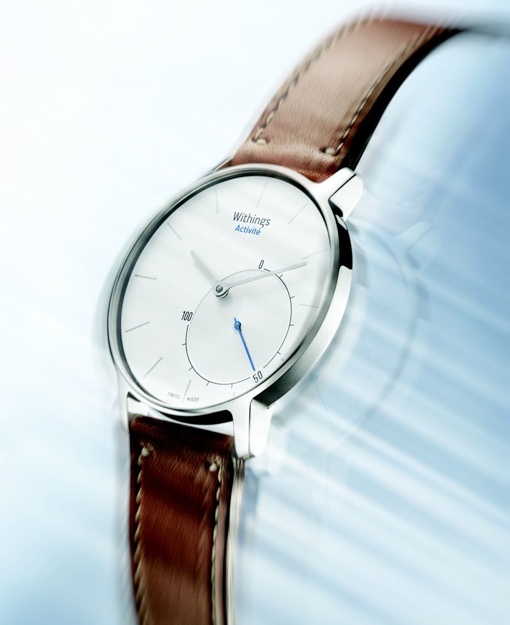 The watch will be available for sale in Fall 2014 at withings.com at a retail price of $390. For more information on the Withings Activité, visit the company’s website.